Make a spectator's card teleport from a packet of five back into the deck. Give the spectator the two black Aces and steal them before he even knows what has happened! 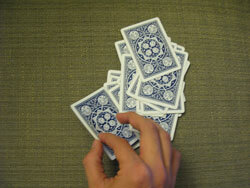 The magician predicts the card the spectator will select. The spectator splits the deck into reds and blacks without looking! Convince the spectator to make a bet he cannot win! 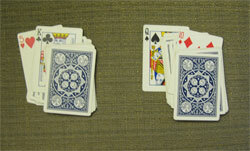 Find the selected Ace from a shuffled packet. Memorize and call out the value of every card in the deck. By following the magician's lead, the spectator does a little magic! A card ends up where the spectator tells it to be.